Portion of a mural depicting a herd of mammoths walking near the Somme River in France (1916). The history of elephants—from gigantic woolly mammoths through to modern forest-dwelling pachyderms—is more complicated than we thought. An analysis of modern and ancient elephant genomes shows that interbreeding and hybridization was an important aspect of elephant evolution. New research published today in Proceedings of the National Academy of Sciences shows that ancient elephants were very much the product of interbreeding between species. Elephants—both those from the ancient past and those living today—were shaped by this mating practice, but it’s not something the two remaining species of elephants are into anymore. Interbreeding among closely related mammalian species is fairly common. Good examples today are brown bears and polar bears, Sumatran and Bornean orangutans, and Eurasian gold jackals and grey wolves. Evolution does a pretty good job of creating advantageous new traits using the powers of random mutation, but there’s nothing quite like interbreeding, where the traits from two different species get intermixed. And in fact, our ancient ancestors were into the whole interbreeding thing, too, with anatomically modern humans getting it on with Neanderthals and Denisovans. So in a way, we’re also a kind of hybrid species. Elephants, as the new study points out, share a similar past—though to an extent not previously appreciated. Crushed woolly mammoth bone used for DNA extraction. For the study, lead author Eleftheria Palkopoulou from the Harvard Medical School, along with colleagues from McMaster, the Broad Institute of MIT and Harvard, Uppsala University, and the University of Potsdam, sequenced 14 genomes from several living and extinct elephant species, including multiple Woolly Mammoth genomes, a Columbian Mammoth genome (a scientific first), multiple Asian elephant genomes, a pair of African Forest elephant genomes, two Straight-tusked elephant genomes, two African Savanna elephant genomes, and, amazingly, a couple of American Mastodon genomes (which technically speaking aren’t elephants). Incredibly, the researchers were able to generate high-quality genomes from samples that haven’t been frozen and are more than 100,000 years old; gene sequences were extracted from bits of bone and teeth found in well-preserved remains. “The combined analysis of genome-wide data from all these ancient elephants and mastodons has raised the curtain on elephant population history, revealing complexity that we were simply not aware of before,” said Poinar. For example, the researchers learned that the ancient Straight-tusked elephant—an extinct species that stomped around Europe between 780,000 and 50,000 years ago—was a hybrid species, with portions of its DNA being similar to an ancient African elephant, the Woolly Mammoth, and Forest elephants, the latter of which are still around today. 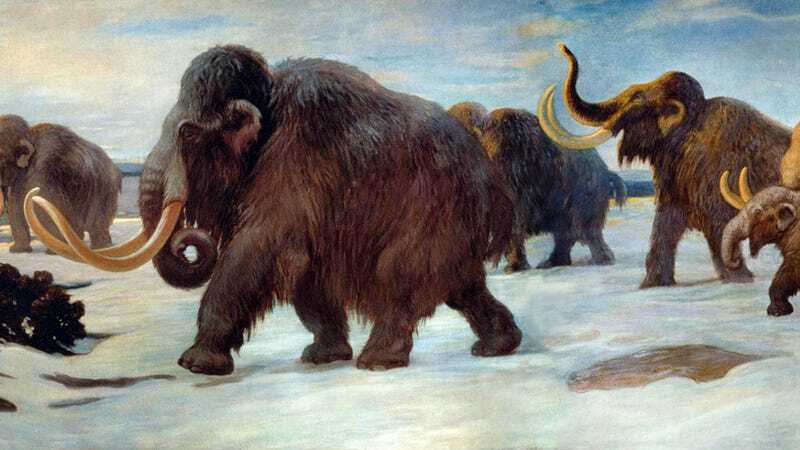 They also uncovered further evidence to support the suggestion that two species of mammoths—the Columbian and Woolly Mammoths—interbred. This idea was first proposed by Poinar in 2011. Despite their different habitats and sizes, these creatures likely ran into each other near glacial boundaries and in more temperate regions of North America. Indeed, it shouldn’t come as a surprise that these ancient elephants frequently bumped into each other; for a time, mammoths had a territory that extended from modern-day Portugal and Spain all the way to the US East Coast. A cross-section of a woolly mammoth shin bone. The researchers also learned that the two still-living species of elephant, the Forest and Savanna elephants, diverged from a common ancestor about 2 million to 5 million years ago, but they’ve lived in near-complete isolation for the past 500,000 years. Despite living in neighboring habitats, these elephants don’t like to mix. Rogers said the paper also tells us that what we view as big physical dissimilarities may not be such significant differences to the elephants. Rogers is particularly stoked that the researchers were able to obtain genetic sequence data for an elephant from Borneo. These are very small populations that have been isolated for quite some time, and the results of the new study match this reality by exposing their very low genetic diversity. For Lynch, the most surprising aspect of the study was just how much ancestral hybridization was going on in the history of elephants, particularly between Straight-tuskers and Woolly Mammoths. He also says the new study is a great example of open science. Looking ahead, the researchers would like to explore how (and if) the intermingling of genetic traits may have been advantageous for elephant evolution, like an increased tolerance for hew habitats and climate change.